A movie that knows exactly what it is, this one works because it is pure action, with little attempt at going for plot, humor, or characters. This movie is an action spectacle that never quits. The stunts and effects here are off the charts and the scale is massive. The Rock is the star and this is his best movie yet. 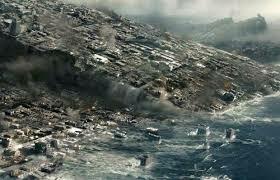 It’s also one of the better disaster movies of are time, second only to Armageddon. The movie works because it doesn’t try to be funny (after all, these movies always try to be funny and never actually are.) Sure, there are some corny moments, here and there, but most of the film is pretty thrilling. San Andreas is a fun action movie that surprisingly turns out to be pretty good. I say surprisingly because there’s no question, this film had a lot going against it. It hardly looked like it had a chance of being a decent film. After all, the only real star on screen here is the Rock, headlining his own movie with a huge budget, something he hasn’t done successfully since The Rundown. The Rock has made a career, over the past decade, of appearing in B movies such as the GI Joe films or those of the Fast and the Furious series. These movies generally don’t turn out to be very good. And on top of that, the premise to San Adreas seems like something that we’ve seen before. Another disaster movie with the world falling apart. And yet the movie does work. That’s due to a number of factors that manage to strike all the right notes. First off, the effects are amazing. Sure, they are all computerized, but boy does this look good. The same can be said of the overall action. The movie is composed of one stunt after another, and they are all well-crafted and exciting. You really feel the intensity behind every stunt. In the wrong hands this movie could have seemed like an action-overload and tired the audience out, causing them to stop caring about what was happening. It’s easy for an audience to become desensitized to the excitement by a movie that gives you big thrills from the very beginning. Yet with this film, that never really happens. That’s probably because the movie puts it’s full concentration and effort toward the action, more than anywhere else. That means neither plot nor characters nor humor supersede the action here, and that strategy pays off. Regarding the humor, this movie knows how to NOT push for it the way these films usually try to. When you look at all of the disaster movies, from the past two decades or so, from the two volcano films (Dante’s Peak and Volcano) to the two meteorite films (Deep Impact and Armageddon) to the two Roland Emerich directed films (2012 and The Day After Tomorrow), the one thing they all have in common is that they are shrouded in bad humor. The movies constantly try to make jokes and very few, if any, of these jokes actually work. San Andreas seems aware of this fact, and so for the most part, it avoids trying to be funny. It wants us to take the story and the death of characters seriously and so it sets that up by giving us a dramatic and tense tone. This all starts with the opening sequence, which is very much like the opening to Cliffhanger. In that Stallone B movie classic’s introduction, a woman is hanging from a rope line, over the edge of a cliff, and is dropped to her death. Here, in San Andreas, a woman is driving her car around a bend on a mountainside and texting as she moves through the sharp and narrow curves on the winding road. Obviously we are meant to think that she will get into an accident because of her texting, but actually what happens to her could have happened to anyone. A pile of rocks plummets down the mountain and slams into the car, pushing it over the edge. The car now goes flying off the cliff, landing on the side of the mountain. 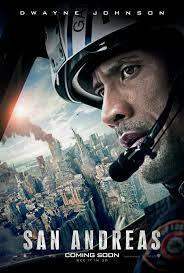 That’s when Ray (The Rock), and his rescue team are called in. This team pilots a helicopter and gets into the cliff. We stay with them, inside the chopper, seeing what they see as they pass a rock wall and suddenly see the car stuck on the cliff’s edge, pressed into the wall. The emergency rescue is impressive. Especially in the way that the movie takes it’s time, reassuring the woman and sending one very confident guy down first. When things get even worse than expected, Ray needs to go down and help out himself. It turns out to be a very exciting, edge of your seat, kind of scene. Now we get the usual stuff about meeting the character back home and learning all about his life. Only this movie handles it all quickly. Amazing since there are so many characters here and relationships to set up, yet it is all pretty much done in once scene. Ray goes to pick up his daughter, Blake, at the house of his ex-wife, Emma (Carla Cugino.) Once there, he sees Emma’s boyfriend, Daniel (Ioan Grunfeld) and learns that Emma and Daniel are moving in together. This is the kind of story structure that’s cliched and inevitable for a film like this to have, only here the movie knows we have come for the action and not the relationships, and so it really rushes us along to get to the next big stunt. Meanwhile, at a nearby university, there is a Professor named Lawrence (Paul Giamatti) who is teaching his students all about the San Andreas fault. He tells them that the next earthquake along the fault line is more than a hundred years overdue and that at this point, it’s not a matter of if, but when. Lawrence unloads a few more facts onto the young minds of his students, and then calls it a day. He’s studying patterns in tremors that might help predict an earthquake, and his partner, Kim, shows up wanting Lawrence to come with him to the Hoover Dam. When we join back with Ray, it’s actually his daughter who we start following, on her road trip with Daniel, to a job interview. First she needs to wait in the lobby of a building while Daniel takes an important meeting. Sitting there, in the waiting room, Blake meets Ben and Ollie, two British kids who are very interested in her. Ben is around the same age as Blake, and Ollie is his younger brother. Ollie gets Blake’s number for Ben, saying that his older brother is too embarrassed to do it for himself. This is where the story opens itself up to give us a little humor, more than in any other spot of the movie, and some of it, involving Ollie, actually works. The next thing you know, Daniel is done with his meeting, and he and Blake are headed down into the garage to get their car and take off. That’s when the earthquake hits. It is tremendous to the point where the entire garage caves in on their car and Blake gets her leg stuck under the seat in front of her. Daniel tries to get her leg out, but has no success, and so he runs away. Once back inside the building, he tells a security guard about Blake, but then he leaves her and runs off, following the crowd of people exiting the building. From here, the real stunts begin. There is Ray showing up at the rooftop where Emma was having lunch when the earthquake hit, arriving in a helicopter to rescue her. Then it’s the two of them, together, trying to find and save their daughter and taking all different vehicles in order to do so. From the helicopter to a pickup truck to a small plane to a motorboat outrunning a tsunami tidal wave, it’s all a lot of fun. The different vehicles used help make the movie continue to feel fresh as each vehicle represents a different portion of the film. Considering that there isn’t much plot, the action scenes fill its place nicely. I never thought this movie would be so much of a thrilling ride as it turned out to be.